As part of my branching out in 2018, I have become a stockist for two scenery manufacturers. One of which deals with plastic scenery! I received my stock last week and I've had the time to paint up one piece so far – a Escarpment / Mountain Range. It is my delight to present the eighth linked article by Andy Jefcoate in his adventures with Flintloque. 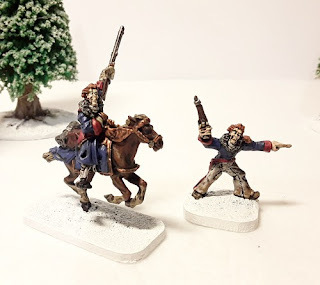 This time he is giving legs to a marshal of the Ferach Empire making a foot conversion of Ney bravest of the brave from the mounted version LE019. What will the Marshal do when he meets Saindoux and his fellow survivors in the retreat from Moskova? Have a read and thanks! Looks like TMP messed up again! Sorry everyone, Black Powder Fantasy Board. Will re-try. PV – What a great idea for dual-use terrain! Definitely on my list to order. Looks perfect for my 1/72 NWF.